Although about a year old, a lot of people have not heard of this game. This deeply creepy first-person action adventure from Frictional Games may be so low budget that it first crept out of the grave in 2006 as a free online demo, but it delivers in the shivers department. 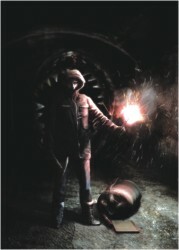 Although there isn't much here for action-first splatterfest fans, and a few technical glitches make some aspects of the design more frustrating than frightening, a constant sense of peril and isolation mean that you shouldn't play this one unless you're happy to sleep with the lights on for a while. As with all effective horror, atmosphere is paramount here. Penumbra gets off to a Lovecraftian start with the lead character, Phillip, getting a letter out of the blue from his long-missing father. The old man was apparently declared dead some 30 years before, but that didn't prevent him from licking a stamp and directing his son to a safety deposit box filled with indecipherable notebooks and a map of northern Greenland. All of this is more than a tad surreal. None of the backstory is explained, there is no character development, and you're not even clued in on why Phillip decides to head off to Greenland and wander around by himself in a blizzard. While this style of storytelling won't please fans of rigorous plots, the vagueness gives the game a gauzy, dreamy vibe. All of the action takes place in a mausoleum-like abandoned mine, too, which heightens both the weirdness and the sense of being detached from the real world. Yet at the same time, this adventure is down to earth in many ways. Interacting with your surroundings is courtesy of a standard point-and-click interface, but you also have the ability to manually manipulate just about every object in the game. Doors, for example, aren't opened simply by clicking on them. Instead, you have to click on them and then pull them open by drawing back the cursor. Combat is a bit iffy, though. It works along the same lines as what's described above, which means that you fight by mimicking actual movements like swinging a hammer or a two-by-four. The feel is similar to the mouse-swing mechanic in a golf game. This makes battles more intense than in the usual click-to-kill game, as your occasional bouts with creatures like undead dogs and giant spiders are realistically frantic and desperate. Unfortunately, fights are also so frenetic that it's almost impossible to control your movements. The camera angle locks when you hold down the mouse button and go into attack mode, which is a big headache because the nasties you battle never stay fixed in one spot and can take a lot of punishment before shuffling off this mortal coil. But maybe that would have made things too easy. Other aspects of Penumbra are similarly low key. Visuals are sparse but effective. Yet even though the visuals are a bit rough, the grainy textures, smeared brown-and-gray backdrops, and heavy shadows clouding details everywhere seem calculated to enhance the sensation that you're in a nightmare. If the graphics were sharper and more realistic, the creep factor wouldn't be nearly as strong. The game's audio is stellar. This game may have been made on the cheap, but the developers didn't cut corners when it came to dialogue and voice acting. Even with the solid presentation, Penumbra is exposed as the work of a small time developer in spots. The biggest issue here is length. Even with a number of tough fights and lots of exploring, you can finish the game in six or seven hours. From the same "Why the heck did they do that?" department comes the decision to lock out saving on demand in the default configuration settings. To enable this undocumented feature, you need to edit the config file with a text editor. Doing so isn't rocket science (all you need to do is change a "false" statement to read "true")--and the default autosave and option to save manually at artifacts in specific locations actually work great--but a feature like saving at any time shouldn't be hidden or require any messing around outside of the game itself. Even with these eccentricities, Penumbra: Overture -- Episode One remains a great spookfest. The physics engine, the unremittingly grim and bizarre storyline, and the fact that you can be killed at almost any moment by some creature lurching out of the darkness really get into your head. Bring on episode two. The "Transformers" series has been fascinating children and grownups alike for decades about smart robots and their capabilities to help mankind. But it's a wonder whether we'll see robots with Transformers' capabilities during our lifetimes. Robotics is the science of creating artificial intelligence. From the simplest of automated machines to the most complex “real” transformers, robots are more ubiquitious than you might imagine. While full-scale Transformers seem a little implausible - and impractical - it turns out that some existing robots have a lot in common with Transformers. 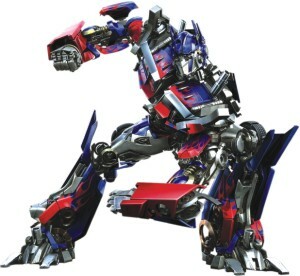 Could Optimus Prime, leader of the the autobots who transforms into a smashing Mack truck, ever be real? Engineer Michael D. Belote explains what it would take to build a full-scale tractor-trailer that can convert into a bipedal robot. First, Prime has to be a self-reconfiguring robot. Some self-reconfiguring robots, or robots that can change their shapes to perform different tasks, exist today. However, they're very different from Optimus Prime. As Belote explains: With self-reconfigurable robots, the engineer typically prefers to keep the individual, mobile modules small, simple, inexpensive, and interchangeable; in the case of Optimus Prime, however, we are dealing with a robot whose individual modules are as large as the cab of a semi truck. Even if building such modules were possible, the expense would be exorbitant, and the extraordinary complexity would make it virtually impossible to ever get all of the systems operating properly together. Spending a scorching summer evening in a cool winter garden sounds pretty appealing doesn't it? Well, it wasn't exactly decorated with flowers, but Sheraton's Winter Garden was pretty jam packed on the 31st of May with well over a thousand people for the release of Nirban's debut album titled, “Chol Cholath Chol.” While two humongous projectors displayed “flashy and fiery” music videos of their title song, the stage was well set up for a live performance by Nirban (with posters in the back saying “Mizan abong tar band”) to be followed by Dipto, Punam and Ornob (aka Ornob bhai). The event started almost an hour later than scheduled as per the Bangladeshi customs at around 7:00 pm, hosted by Laura and with much appreciated short speeches from the Director of Bengal Music, Ms. Nawshin Khair, Chief Advisor of ATN Bangla, Mr. Saiful Bari and the honorable guest Dr. Yusuf Merchant. Soon after a little tweaking of equipments, Nirban advanced to present to the crowd what they had! Opening with an English song (of which the only word I could make out was “ecstasy”) the Band moved on to “Hotath Brishti” which was very well received by the crowd. Keeping their title song for the last, Dipto followed Nirban with a “jhakas” instrumental and songs from his new album “Akta Shorol Aongko” where he attempts to address the mathematics of love in a world where undoubtedly 1+1=1. Be it for the allure of the performance or Sheraton or escaping from the scorching heat, the audience certainly made the inauguration a success. As an incoming new band, Nirban kept their name with their songs; so check them out if you will. It's sure to hit the stores by now. Till next time, adieu! One year after the extraordinary events of “The lion the witch and the wardrobe”, the four Pevensie siblings Peter, Susan, Edmund, and Lucy are magically transported back to Narnia so we can have a sequel. Time travels faster than a watch can keep up in Narnia. Upon arrival they discover that more than a thousand years have passed since the last movie. During their absence, the Golden Age of Narnia has come to an end and the despicable King Miraz, uncle to the true heir, Prince Caspian, has taken charge. The young Prince Caspian has been forced into hiding because evil uncle wants to keep the power in his bloodline. That means Prince Caspian must die. With the help of Glenstorm the Centaur, Trufflehunter, a loyal badger, Trumpkin a skeptical but dedicated dwarf, Reepicheep, a valiant mouse and scores of other species of friendly Narnian animals, Caspian forms an army to meet Miraz's countless, mighty human warriors. The Pevensie children join forces with Prince Caspian and the rest of the Narnians on an amazing journey to find Aslan and rescue Narnia from the oppressive hold of Miraz. It's a continuation of the last story so new viewers will find it a little confusing at times. The movie doesn't bother setting up establishing characters because it assumes everyone watched the first episode. This is an action movie and hardly anything else. The entire story is about Prince Caspian fighting to win back his lost kingdom. And that involves its of battles with lots of evil doers. So there's not that much story but the action does make up for the lack. Special effects are better than the last movie with mythical creatures looking even more alive. The smart and quintessentially British plot has been replaced with smash, boom and bang. Lots of it. The magic though is a little lost. Makes you wonder what the next installment will be like and there will be more. The first movie lacked much humour and this would have been no different had it not been for a tough-as-nails mouse called Reepicheep with plenty of funny insights, wisecracks and stingy one liners. It's a pretty movie with a dark story line and massive action and once again a mouse that saves the day. With humour that is.